Researchers at University of Jyväskylä (Finland) and University of Tampere (Finland) together with BioNavis Ltd (Finland) have developed a novel nanoactuator system, where conformation of biomolecule can be tuned by electric field and probed using optical properties of gold nanoparticle. Over the past decades, nanoactuators for detection or probing of different biomolecules have attracted vast interest for example in the fields of biomedical, food and environmental industry. 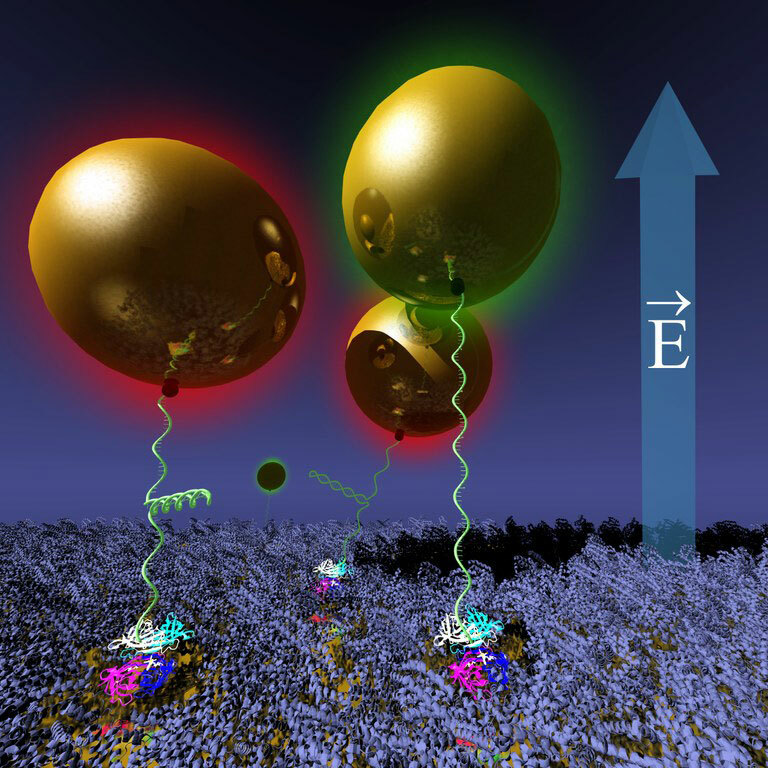 To provide more versatile tools for active molecular control in nanometer scale, researchers at University of Jyväskylä and University of Tampere have devised a nanoactuator scheme, where gold nanoparticle (AuNP) tethered on a conducting surface is moved reversibly using electric fields, while monitoring its position optically via changes of its plasmon resonance. Forces induced by the AuNP motion on the molecule anchoring the nanoparticle, can be used to change and study its conformation. – Related studies use either organic or in-organic interfaces or materials as probes. Our idea was to fuse these two domains together to achieve the best from the both worlds, says postdoctoral researcher Kosti Tapio. According to the current study, it was shown that AuNPs anchored via hairpin-DNA molecule experienced additional discretization in their motion due to opening and closing of the hairpin-loop compared to the plain, single stranded DNA. – This finding will enable conformational studies of variety of multiple interesting biomolecules, or even viruses, says Associate Professor Vesa Hytönen from the Protein Dynamics Group from the University of Tampere. Besides studying the structure and behaviour of molecules, this scheme can be extended to surface-enhanced spectroscopies like SERS, since the distance between the particle and the conducting surface and hence the plasmon resonance of the nanoparticle can be reversibly tuned. – Nanoparticle systems with post-fabrication tuneable optical properties have been developed in the past, but typically the tuning processes are irreversible. Our approach offers more customizability and possibilities when it comes to the detection wavelengths and molecules, states Associate Professor Jussi Toppari from the University of Jyväskylä. The research was funded by the Academy of Finland (OMA – programmable materials) and the Finnish Cultural Foundation (the Central Finland Regional Fund). Authors thank BioNavis Ltd for equipment and essential expertise in the SPR analysis. Be the first to comment on "Researchers Develop A Novel Nanoactuator System"